Berry bushes come in many sizes and produce an abundance of edible and non-edible berries. Well-known berry bushes include raspberries, blueberries and blackberries, but thousands of other types of bushes produce various kinds of berries and hybrids worldwide. Make sure your plant is properly identified before eating berries; some wild species sprout toxic berries. 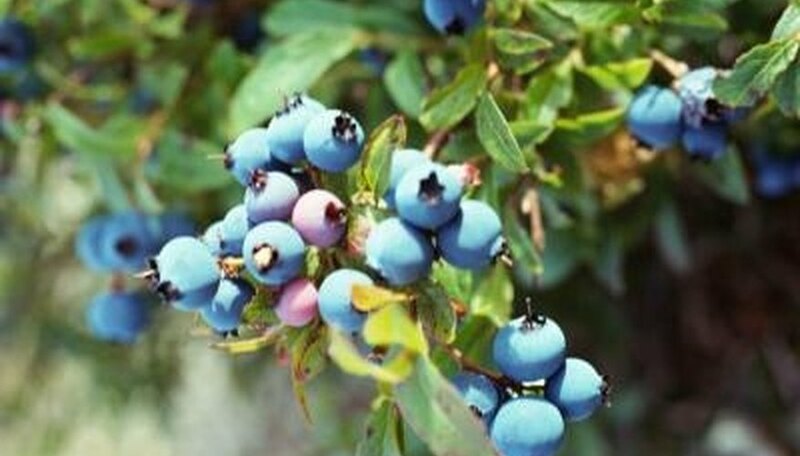 Choose from more than 100 different Northern highbush, rabbiteye or lowbush blueberries.The size of these bushes varies from 3 to 8 feet, depending on the species. Many different types of Northern highbush blueberry bushes produce deep-green foliage throughout most of the year, and the leaves change to yellow, burgundy or red in the fall. The berries usually bloom in the spring or summer, depending on the type of berry bush. The size and shape of the blueberries varies greatly. Chandler blueberries take longer to ripen, but these beauties are very large and plump. Toro blueberries have a mild, sweet taste and hang off the branches like grapes. Dozens of raspberries grow on bushes, also called canes. Most types produce very sweet red or pinkish berries. These bushes bare fruit in the summer or fall, depending on the cultivar. Raspberry leaves produce light- to medium-green foliage with a maple leaf or heart-shape with jagged edges. Meeker and Cascade Delight bear fruit the summer, while Caroline and Heritage sprout raspberries in the fall. Raspberries bushes don't usually produce fruit the first year. Raspberry bushes grow low to the ground, reaching 24 to 30 inches tall. Various types of blackberry bushes produce different types of berries. They grow best in soils with a pH between 4.5 and 7.5, according to Texas A&M University. Some of the bushes have thorns. Rosborough blackberries grow erect on thorny bushes and Navaho grows erect on a thornless bush. The foliage is deep green and oval or heart-shaped, depending on the species. Most types of blackberry bushes grow 3 to 6 feet tall. All sorts of berries grow on bushes such salmonberries, tayberries, thimbleberry, nannyberry, mistletoe berry and many more. 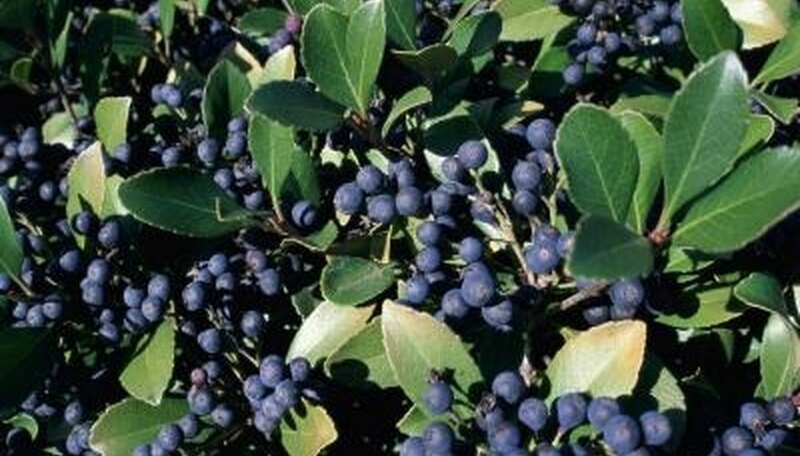 Nannyberry bushes grow in Northern woodlands and marshes. These berries look and taste similar to chokecherries. Mistletoe berries are toxic red berries that grow on bushes in forests across America and other countries. Salmonberries look like reddish-orange raspberries, but the bushes grow only in Alaska and Canada. The tayberry bush is a hybrid of the black raspberry and loganberry plant. Thimbleberry bushes are related to raspberry plants. These soft berries grow in Northern Mexico and Alaska.